If you want a young therapy puppy to train from start go here: We Have Puppies! A Kewpie Dog can describe any one of the Queens Bear breeds.....simply their smallest version between 4 and 12 lbs. The Kewpies on this page have been kept together as a group for several months to work on their house-training and socialization. Raised in the house, they are confident with the comings and goings of an active household. They are used to strangers entering the home. They will be especially easy to finish training in your home as your emotional support therapy dog as all are mostly house trained and all are easy going and affectionate with new people. But as in people, dogs' temperaments are individual. 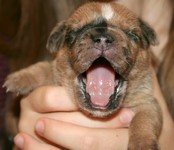 They each have a different approach to life and those differences will be described by their photos so that you can make an informed choice in which dog's personality will best suit your unique household and your own temperament. Expect a getting to know you period when first changing households. Adult dogs are sensitive to change and the bonding process takes a number of weeks until they are fully confident of you and learn to love you completely. Pictured is our smallest type: "Kewpie" five pound adult female. She has moxy and knows how to charm everyone that meets her!